Welded metal pipes with scroll and ball decorations painted gold. 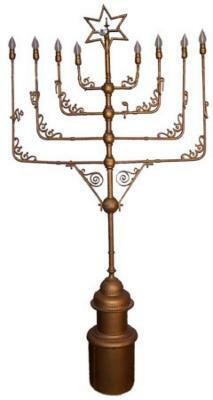 Nine branched candelabra with Hebrew letters welded to each branch. Star of David welded to central branch. Situated in front of the ark in the basement vestry room. Dedicated in honor of the ordination of Rabbi Elena Stein by her parents, Jacob and Polly Stein.